Uuups, sometimes we are looking for a way to do simple things and do not remeber how easy it was. Question: How can one hide/show the start icon in taskbar of Windows Mobile 6.1 (and before)? Answer: Use the API provided by Microsoft for this: SHFullScreen! No need to use FindWindow and subclass, very simple use. Ah, remeber that this will NOT work on Windows Enbedded Handheld 6.5.3 or Windows Mobile 6.5.3 or whatever you call it. The API will simply not do it’s work. 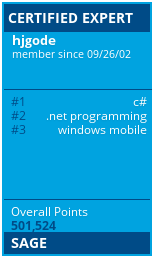 Here is a C# example for SHFullScreen usage. As described in this post, I was looking for a way to get a proper view of pages designed for QVGA screens on devices with higher resolutions like VGA. sometimes you might want to ‘lock’ the screen, better say: disable touch input. For example, if you put the device in a pocket, to avoid accidentally tapped screen elements. Before WEH and Windows Mobile 6 it was easy to catch all keys including the function keys in a Compact Framework (CF) application, you simply had to use Allkeys(true) and Form.Keypreview=true. Actually, with Windows Embedded Handheld (WEH) or Windows Mobile 6.5.3 the above will not work for the F1 and F2 key. There are simply no KeyDown and KeyUp events reaching your CF application. With WEH Microsoft moved the Start button from the taskbar at top to the menu bar at bottom. Further on, the menu bar is now using graphic tiles to display the top menu, the Close and OK/Done option. The OK/Close button also moved from taskbar to menu bar. Additionally the menu bar is higher than in Windows Mobile 6.1. That leaves less space for your client window. Due to the above changes in the UI, the window messages are routed in another unknown way and normally a CF application does not get F1 and F2 key messages. Possibly the CF main message queue gets notification messages but these are handled internally by the CF runtime, you only see the menus are working.